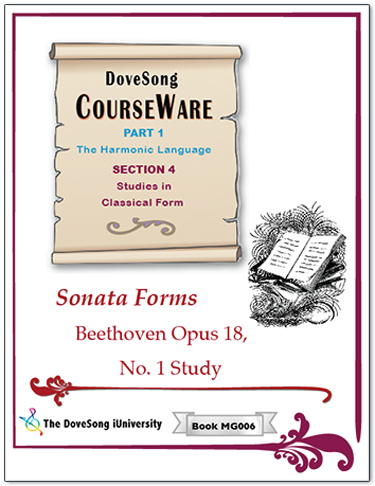 The study of Form in the DoveSong iUniversity centers on the forms created during the 18th century, excluding the counterpuntal forms that are really a product of an earlier age. The great forms perfected by Mozart and Haydn in the 18th century were adopted by the composers of the 19th century and given a new meaning. Studying these forms directly by studying the scores of the masters is a most rewarding experience. The masters show us how we can deal with form when writing music and how form can be established through harmony, melody and rhythm. As is the case with the study of fugue, the study of the so-called "sonata forms" had become a feast of "rules" in the academic world and unfortunately students were little acquainted with the true nature of form that cannot be conveyed with "rules," but only by direct appreciation of the music itself, audibly and visually through study of the scores. This is how I taught myself, and as I studied these forms from the masters' blueprints (the scores), I realized that the way that musical forms were being taught in standard university courses by memorizing rules that had been created by music theorists after they themselves had studied the masterworks was no longer necessary, as the music and the scores, and now as we begin to publish these annotated scores, are available for all students to study, either at home or in school or university. 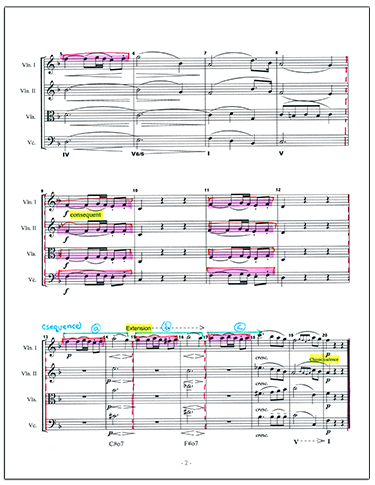 During the 1990s, I developed a method of color-coding scores to show melodic and motivic development and use, sections, sequences, and so forth. The publication of studies such as these was not possible before now because publishing costs for color were prohibitive. Using the state-of-the-art internet technology that is available today, there is no longer a limitation. I look forward to the new generation of composers - our kids - who realize that we are all at the crossroads now: the end of the old road, the old cycle - the beginning of the new. These books are set for publication beginning in 2012.